The Victorian Caravan Parks Association (VicParks) has officially welcomed iBuild as an associate member and preferred supplier for accommodation units. 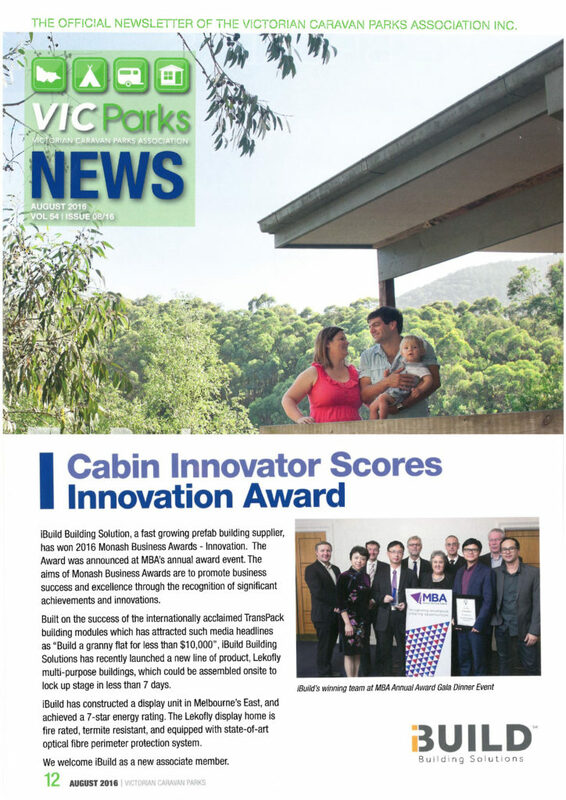 iBuild has been featured in the August 2016 Newsletter of Victorian Caravan Parks Association (VicParks), in an article entitled "Cabin Innovator Scores Innovation Award". "iBuild Building Solution, a fast growing prefab building supplier, has won 2016 Monash Business Awards - Innovation. The Award was announced at MBA’s annual award event. The aims of Monash Business Awards are to promote business success and excellence through the recognition of significant achievements and innovations. "Built on the success of the internationally acclaimed TransPack building modules which has attracted such media headlines as “Build a granny flat for less than $10,000”, iBuild Building Solutions has recently launched a new line of product, Lekofly multi-purpose buildings, which could be assembled onsite to lock up stage in less than 7 days. "iBuild has constructed a display unit in Melbourne’s East, and achieved a 7-star energy rating. The Lekofly display home is fire rated, termite resistant, and equipped with state-of-art optical fibre perimeter protection system. "We welcome iBuild as a new associate member".